The committee has recommended divestment only three times in its entire history. Students rally for divestment. (Courtesy of the Brown Divest Coal Campaign). Earlier this week, in another victory for the growing movement pushing colleges and universities to divest from companies profitting from fossil fuels, a Brown University oversight committee voted to recommend that the university divest from the country’s 15 largest coal companies. 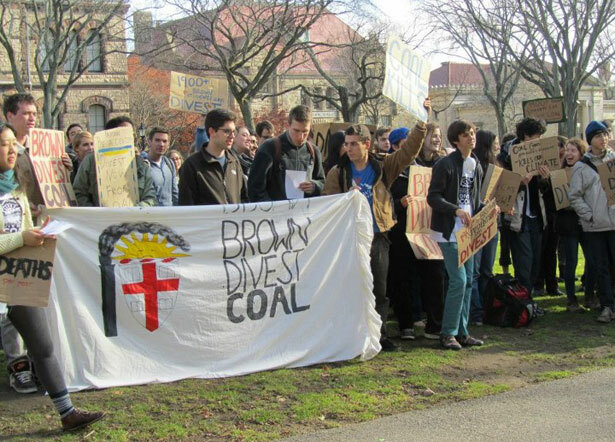 The divestment campaign began last October, when a student group, called the Brown Divest Coal Campaign, implored the university to stop investing in coal. The committee, ACCRIP (Advisory Committee on Corporate Responsibility in Investment Policies), is charged with ensuring that the university’s investments match the institution's ethical principles, and it has recommended divestment only three times in its entire history – from companies operating in Darfur during the genocide, from tobacco corporations, and from HEI Hotels. In each case, the board of trustees complied with the committee’s recommendations. Emboldened by the announcement, student activists are now demanding that Brown’s board of trustees divest from the 15 largest coal companies at its upcoming meeting in May. Brown’s president has confirmed that divestment will be on the agenda at that meeting. “The board of trustees can’t ignore this recommendation. It can’t ignore the pressure from Brown’s student body and from students around the world. And it can’t ignore the dictates of science and ethics,” said Jordan Schulz, a student leader for the Brown Divest Coal Campaign. Since September, more than 2,100 undergraduates, along with hundreds of alumni and faculty, have signed a petition urging immediate divestment from the country’s 15 largest coal companies. The university’s student council voted to endorse divestment last month. Tom Steyer, a well-known hedge fund manager, recently wrote a letter to the university’s president recommending divestment and stating that divestment would not threaten the university’s financial status. Brown’s administration has said that the university’s investments in the 15 largest coal companies are worth less than $2 million in total. The campaign is part of a national movement of students calling for fossil fuel divestment that has already spread to more than 300 campuses. To date, five schools — Unity College, Hampshire College, Sterling College, Santa Fe Art Institute, and College of the Atlantic — have agreed to divest, and many more are talking about it. Read more at Student Nation about student activism and the 250-plus university divestment campaigns across the country.